Artistic people are often referred to as different, unusual, eccentric, or even odd. Some embrace these labels. Some feel vilified by them. The truth is...we are "different"...AND THAT'S OK!! We think differently. We communicate differently. We express ourselves differently. We see the world differently. 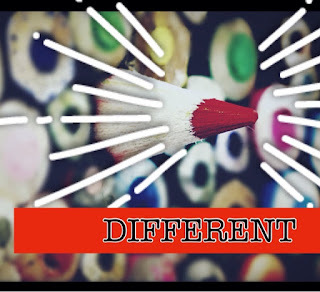 WE ARE DIFFERENT! What some consider unusual or odd is the very thing that allows us to create, innovate, and express in ways that others have not considered or lack the skill set to bring to fruition. We are able to show others a new perspective that they may not have seen on their own. If we are honest, we are all different. That is what makes the world so wonderful and challenging at the same time. Each of you should use whatever gift you have received to serve others, as faithful stewards of God's grace in its various forms. If anyone speaks, they should do so as one who speaks the very words of God. If anyone speaks, they should do so as one who speaks the very words of God. If anyone serves, they should do so with the strength God provides, so that in all things God may be praised through Jesus Christ. TO him be the glory and the power for ever and ever. Amen. So often we walk into churches and find a group of people gathered together that seem very similar. They can look the same, sound the same, act the same...and have a host of other similarities. There is almost an unspoken "normal" for given collection of believers. I know that many of you reading this will either understand my point or begin to form your defence of how your church is not like what I've just written. I'm not judging...I'm just making an observation from my personal experiences. I'm not sure I've ever walked into a church & felt like I was their kind of "normal". I'm ok with that! ha ha I believe that when we embrace who God has made us to be...we will no longer feel a need to fit in with everyone else. We can be anywhere and be at peace with who we are & who we were made to be. This will allow us to take what makes us different, unique, or even a little odd....and use it for the glory of God! It will also allow us to celebrate what makes others different & be able to encourage the ministries God has equipped them to accomplish. He has designed us to be different. My gift is not the same as the person behind me. I don't have the same calling/gifting/skill set as the pastor. The couple in my Sunday school class serves in a completely different capacity than I do. God has called us to be who HE has called us to be. We were designed to be different to glorify God & to make Him known. At the same time...we are called to be a family. You know that every family is made up of some "different" type of people that may have varying interests, points of view, approaches to life, and ways of doing things......but you love them no matter! We don't all have to be the same to walk along one another in this life!